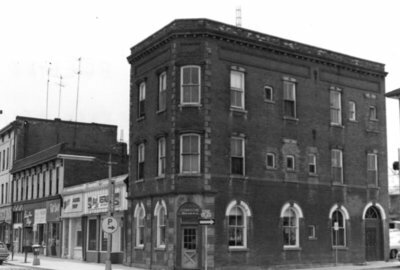 A black and white photograph of 122 Brock Street North. The Ontario Bank building was constructed in 1867/68 by Chester Draper, with George Cormack of Whitby as architect. The bank closed approximately 1890 and it became Edmund Stephenson's telegraph and ticket office. It served as apartments for many years and was renovated and restored by Charles and Ron Schaaf in 1989. 122 Brock Street North, April 1974, Brian Winter. Whitby Archives 01-000-408.